Argggh... Coconut hacking and whacking. Good exercise. Deep breath. I am going to open up a coconut, maybe even three today. I am a sissy. Coconut cutting scares me. I don't do it very often, and not with any grace or proficiency. My coconut cutting is ugly and crude, kind of like an elephant eating with chopsticks. But I like coconuts, and they are very nutritious, especially the young ones with their enzyme-rich juice and fresh, soft meat. There are wonderful people who sell coconuts, like at farmer's markets and at farms in Huelo and Haiku. These are the experts, people who wield a machete like an extension of their arm. With two or three good whacks, they cut perfectly into the husk and open it up. These coconuts look pretty young and green. I'm used to the hard, brown ones. I will look at that coconut with trepidation for a few days, willing up the courage to open it. DH and I have agreed that I have to open it within a week or toss it. Anyhow, coconuts are only good for about a week after being harvested, give or take a few days. They don't stay fresh forever. The method I have finally developed is "hack and whack" on the lawn. On grass. Nice, safe grass that doesn't allow the coconut to roll all over the place as I am trying to whack it. I have tried hacking coconuts on the deck. Bad. They roll around too much. I have tried whacking coconuts on the sidewalk. Also not good. The experts sometimes use a special coconut stump or block of wood. This coconut set up involves a tree stump and a big kitchen knife. That scares me. But maybe these are really young, soft coconuts. Some folks also may have a special stake stuck in a piece of wood or the ground that they then impale the coconut on top of, and rip the husk off with each subsequent impaling. I don't have one of those stakes. I do have a machete and a heavy sledge hammer. And grass. My friends: machete, sledge hammer, grass. Grass is my friend when I am trying to open up a coconut. I like the grass because it cradles the coconut, and holds it in place as I am hitting it. I really like my fingers and don't want to lose them to careless coconut cutting. The grass does get a bit dinged, and slashed, but I like to think of it as "aerating the lawn." Also, my method involves kneeling on the grass, so it's not great for people with bad knees. All right! So it makes a big mess. It aerates the grass. Get the machete and sledge hammer. Make sure the machete is nice and sharp. Figure out which side is the pointy end and which side was attached to the tree. It helps if there is a bit of stalk sticking from one end. I call this the stalk end of the coconut. Oh, this is the part where I pray, "Please let me cut carefully and keep all my body parts intact." Notice the pointy end of the coconut facing to the left. I started whacking at the rounded end of the coconut. This is important. If you have a really YOUNG coconut, a light whack with the machete may rupture the shell and then all the coconut juice spills out. However, I rarely deal with immature coconuts. They are tasty, and have hardly any meat. I usually end up with these hard, feisty old coconuts that have fallen off a tree somewhere by the side of a road. They have super tough husks and hard inner shells and require some major whacking. Hold the coconut in one hand and with short strokes, slice against the stalk end of the coconut. Don't do BIG whacks or big slices. Think small, short whacks. Don't show off. Do short whacks, small chunks. but I would normally start with the rounded, stalk end first. I just didn't take any photos of the initial cuts. The husk is very fibrous and if you try to hack too much and do not have beefy arm muscles, then it's really hard to get the machete to slice all the way through. Do shorter whacks that take out less per whack, but ones that let the machete slice all the way through. It's best to try to hit the same cut if the machete does not go all the way through. This is easier said than done. The machete can also get STUCK in the fibers if you try to take out too much husk. Even if you successfully manage to hit the machete in the same place. Then you'll spend a lot of time tugging the stuck machete out of the coconut husk. I also pull off bits of husk as I go. Do make sure your fingers are far from the machete. Keep your fingers away from the blade. Step 4: Rotate the coconut, and continue hacking in short but firm strokes. If you are making a big dent in the grass, then move the coconut. Continue rotating the coconut, hacking it, and pulling off the husk. With any luck, you have now exposed the eyes. The eyes are at the rounded, stalk end of the coconut, not at the pointy end. but I wanted to show the coconut eyes. Two eyes are visible, and the other is hidden by the machete. They form a triangle. There are three eyes. Uncover as much of the husk around the eyes as possible. Feel with your fingers to see which eye is soft and which are hard. Usually there is one soft eye. It's easy to poke a knife through the soft eye. If you are working on a muddy lawn, please rinse off the coconut eyes and husk to get the mud off before draining the juice. You don't want muddy coconut juice. Step 5: Get a bowl or container and something to poke the eyes with: a knife, a drill, etc. Be careful. Poke the soft eye, and then carefully poke at another eye to create an air hole so that when you are draining the coconut, the juice can flow smoothly out and not get stuck. A drill can be a nice tool to put a small hole in another eye. Once the two eyes are open, put your coconut upside down and drain into a container. Let the coconut drain completely. Check occasionally to see if the holes clog up and unclog them if needed. Step 6: Shake the coconut to see if there is any juice left. Take the coconut back to the grass. Continue whacking in short angled bursts to uncover more husk. Continue roating and pulling off the husk. When you are more than half way, turn the coconut and start hacking at the pointy end in small angled whacks. The idea is to husk all the coconut so you only have the inner hard shell left. This can take a while. Step 7: Get the sledge hammer. You can use a regular claw hammer, but they require more force to open the coconut. If you are not at the gym every day and don't have big pecs, use a sledge hammer. So whack the coconut with the sledge hammer several times until it cracks open. Keep hitting it until you have smaller broken bits of shell. This coconut turned out to be rotten. Sometimes it's hard to tell if the coconut is good or not. A fermented smell will usually give it away. Sometimes a really ugly, tough, brown coconut can be good inside. Go, whack the coconut shell. Break up the shell into more gently sloped, smaller pieces. Step 8: Wash off the coconut shell and meat, then use a knife and cutting board. Score the coconut meat in straight lines with the knife. Score repeatedly in the same cut until the knife makes a good cut that reaches the shell. Shallow bits of shell. Score the meat with a sharp knife. Then use a spoon or sharp knife to carefully loosen the meat from the shell. Pry the meat away from the shell with a short knife, carefully. Don't cut your fingers here either. Pull the meat off the shell. If the shell is not too curved, this part is not too hard. If the shell is extremely curved, the meat is harder to remove because of the steeply curved angle pushing against the knife. I like to hit the shell again with the sledge hammer to break it into smaller, more shallow pieces. Step 9: Rinse off the coconut meat. Take the vegetable peeler and peel off parts of the shell that are still stuck. Sieve the coconut juice through a strainer to get rid of little bits of grass. Step 10: Clean up the husks and bits of shell on the lawn. I mulch with smaller bits of husk and compost the bigger chunks. Drink your coconut juice and thank the higher powers that your body parts are intact. If you feel exhausted reading this, then go to Alive and Well health food store in Kahului. I think they still offer fresh young coconut juice in the refrigerated deli section. I did manage to cut all three coconuts that day, two were good and one was rotten. 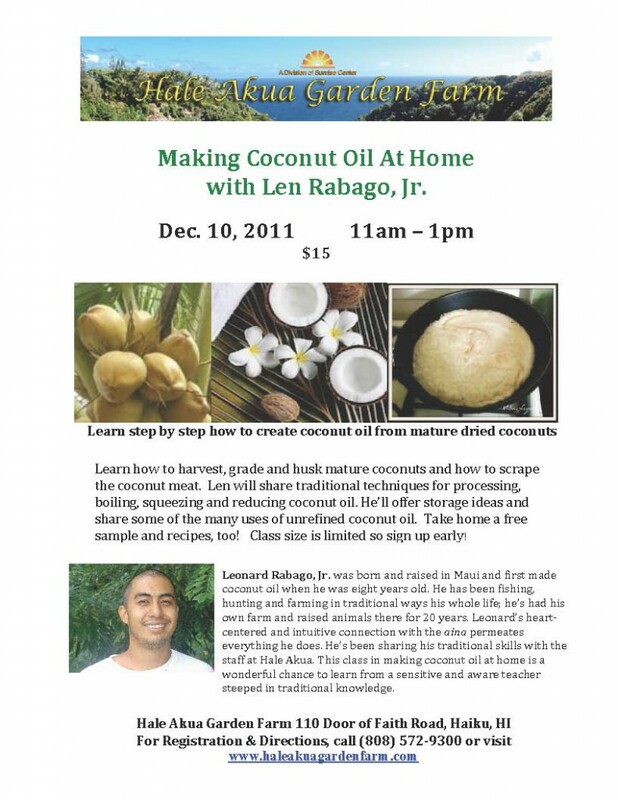 There is a coconut cutting class I am attending on Saturday. I am very excited about it, because maybe I will learn how to cut a coconut with skill. The class is being held at Hale Akua this Saturday at 11 am, and being taught by a local Maui boy who is a second or third or fourth-generation coconut cutter.